Lots of newspaper coverage this week! 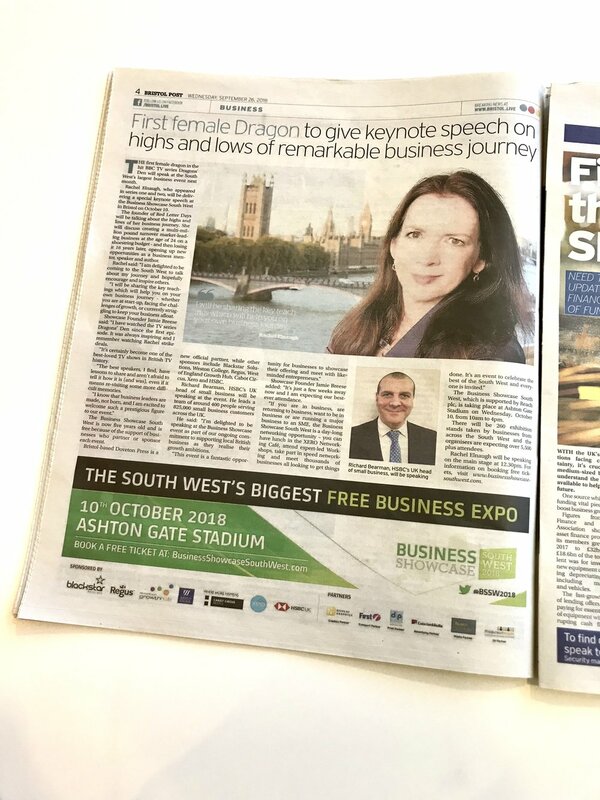 We are thrilled to announce on International Women's Day - that our latest Keynote Speaker for the 9th Business Showcase South West on 19th June at Ashton Gate Stadium is Emma Jones MBE. REGISTER FOR FREE DELEGATE TICKETS - https://delegate-june.eventbrite.co.uk Emma is Founder of Enterprise Nation and a Business Ambassador to the government. She is also co-founder of national enterprise campaign StartUp Britain. She is author of best-selling business books including Spare Room Startup, Working 5 to 9, Go Global, Start a Business for £99, the StartUp Kit, and Going for Growth. We can't wait to welcome her to the South West. She will be interviewed on stage by colleague and journalist Dan Martin. The Founder of BSSW, Jamie Breese, was invited back to the University of the West of England to deliver a 'Networking Masterclass' again to those about to graduate. A thank you to Dr Aida Abzhaparova who puts together the day. Sir Rob is one of the South-West’s best-kept secrets. Discreetly mentoring, always creating exciting new opportunities and often speaking internationally, his humble background makes his journey to the top, even more impressive. Join Rob and Showcase’s Jamie Breese in a pull-no-punches ‘fireside chat’ where Rob will share his inspirational past about leaving school in Bristol with no qualifications. As a teenager Rob started his retail journey, scaling the dizzying heights as a shop-assistant in a fishmonger, then a toy shop. His love for cameras and photography secured him a place in his local photographic store - to somehow managing to create a retail empire of 248 stores and exiting his business by the time he was 22 having created thousands of jobs… and with a cheque for £1 million in the mid-1970s. What’s it like to go back to your old school in a Rolls-Royce? How was he instrumental in later success stories such as Richer Sounds, networking and publishing? What tips can you glean? Plus a Q & A session to motivate you. REGISTER FOR FREE DELEGATE TICKETS. 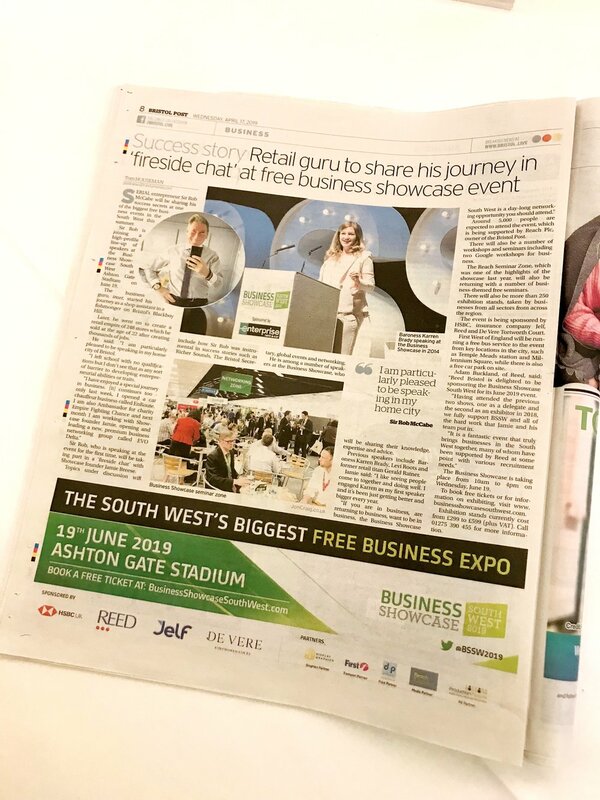 Free delegate tickets are now live via our website for the 9th Business Showcase South West on Wednesday 19th June at Ashton Gate Stadium Bristol.